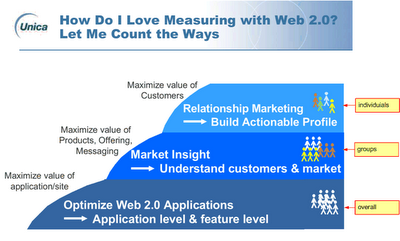 Last week I attended a pretty cool webcast on Web 2.0 marketing and measurement. I've just been too busy to post my summary of it yet. But here it is, for anyone who is interested. This webcast focused on two topics: what Web 2.0 marketing vehicles are there and how to measure in a Web 2.0 environment. second point was taken to not be just collaboration between people, but also as collaboration between people and institutions (companies). 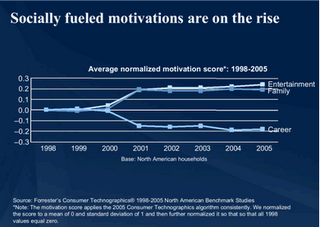 Both of these motivators were wrapped up in the concept of social computing. Shar defined social computing as "A social structure using technology to empower individuals and communities instead of institutions." Her talk seamed to be how to make institutions fit into this model. The Web 2.0 marketing efforts seemed to be that in-road. Most of the Web 2.0 efforts revolve around the growth of socialization on the internet, including a move away from standard interfaces to custom interfaces. A more "personal" web, if you will. Most Web 2.0 innovations (and new web innovation in general) seems geared toward pulling different pieces together in completely individualized ways. Often geared toward fun rather than work. 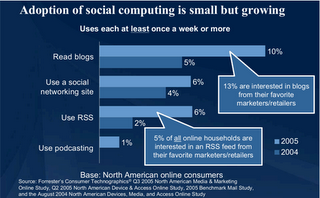 And while this use of the web is still small, it is growing fast enough that marketers cannot ignore it. Approach each as a sort of branding experiment rather than a sales effort. Try to use each to build relationships with consumers and make friends with them. Use unique buzzwords. then look for these buzzwords in tools such as Google Trends to see if buzz is developing around your slogans/unique phrases. Application level KPIs--overall usage. Includes traditional analytics and event-based analytics. Market level KPIs--meaning segment visitors into groups. Especially look for responses to messaging. 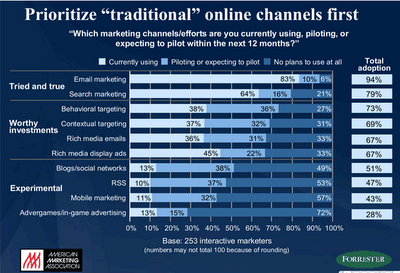 Customer level KPIs--use individual customer behavior to drive individualized offers (permission based offers, etc.) and services then measure usage/adoption rate.